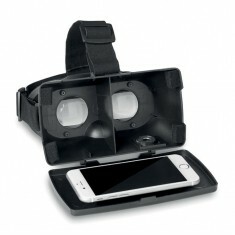 Give your customers a real immersive experience with their own custom printed Virtual Reality Glasses. Whether it’s to get visitors at your stalls to take a tour of your new factory and working space or to send our to loyal customers as a Christmas present, personalised Virtual Reality Glasses come in plenty of styles and everything from cost effective to premium gifts. The capabilities to allow your customers to experience your world through virtual reality is limitless, making these glasses ideal for every industry from housing to manufacturing. 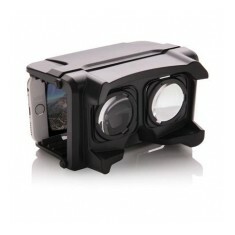 When it comes to cost effective our customised Full Colour VR Glasses are our best. Not only are they cost effective, they are printed in full colour to the entire outer side, giving you an outstanding potential for spreading your message wherever your users look. After a more durable design? Our promotional 3D VR Glasses are made from a tough ABS plastic and comes with an adjustable head strap to fit everyone. Curious to know more about our branded Virtual Reality Glasses? Give our sales team a call and they will be more than happy to help. Printed full colour, full coverage. Flat packed. Fits up to 6" phones. Durable & recyclable material. Virtual reality glasses made out of ABS that can be folded flat to take anywhe.. 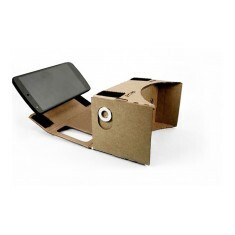 Escape every day life with our custom printed Cardboard Virtual Reality Glasse..
Made from ABS plastic. Adjustable strap. Designed for smartphones. Virtual reality glasses with 3.5mm jack input and adjustable lenses, suitable ..